Move over, Accelerate, you have major company, and it’s in your own barn. 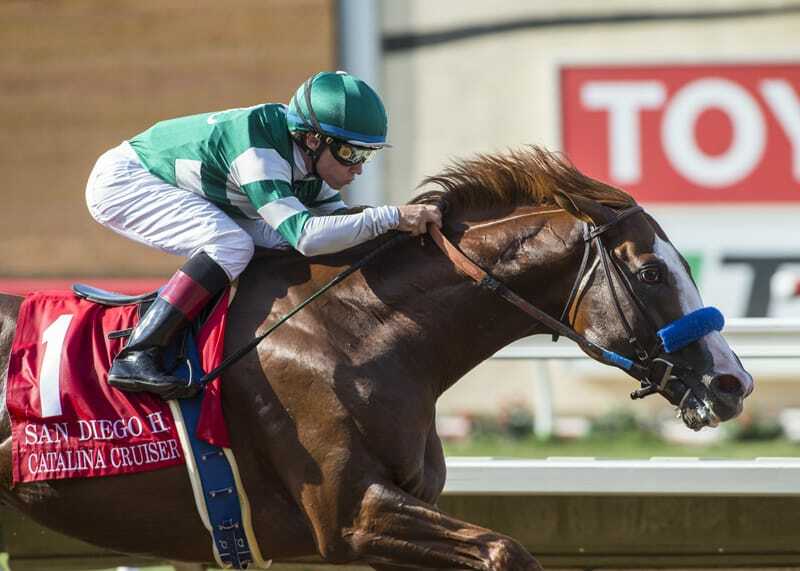 John Sadler unleashed a monster on Saturday in the Grade 2 San Diego Handicap when Catalina Cruiser rolled home to dominate a scratched-down field of five. Right from the gate, Catalina Cruiser went to the front, and as his name indicates, he just cruised around the track with relative ease before easily pulling away at the top of the stretch. The win improves him to 3-for-3 in his career and will likely earn him a shot against Grade 1 company next. Sadler has the challenge of positioning his two stars, as they both have the Breeders’ Cup Classic in their sights. Accelerate’s main goal remains the Grade 1 Pacific Classic, with plans pending for Catalina Cruiser. For Sadler, this is an excellent problem to have because he has a devastating 1-2 punch in the older male division. Monomoy Girl left absolutely no doubt on Sunday (there wasn’t much doubt anyway) when she crushed Midnight Bisou to win the Grade 1 Coaching Club American Oaks by 3 lengths. The win was her fifth in a row, with her last four victories coming against Grade 1 company. She took advantage of a pace-less race and took the field wire-to-wire with plenty left in the tank. This win put the 3-Year-Old Filly Eclipse Award on lockdown for the her, and now trainer Brad Cox will set his sights on the Breeders’ Cup Distaff as her year-end goal. She may skip the Grade 1 Alabama Stakes because of distance concerns, but she will have a prep race before the big event at Churchill Downs. This filly certainly makes things dramatic! After falling behind in the Grade 1 Diana Stakes, like usual, Sistercharlie was swung wide by John Velazquez but looked to have a bit too much left to do in deep stretch. However, the relentless filly kept finding more, and she just barely got up in time to nip an impressive Ultra Brat right at the wire. Sistercharlie now has two Grade 1 victories this year, and trainer Chad Brown believes the filly could go after a third in three weeks in the Grade 1 Beverley D. Stakes at Arlington Park. This filly should excel with added distance; she just seems to hit high gear late in the race when going a mile and 1/8. Brown will have several options with her to round out the rest of the year.